So he then handed Him over to them to be crucified." Which day of the week was the 'day of preparation for the Passover'? A good answer will give a day of the week, or explain why it is not possible to give one. There are some difficulties with the chronology of Christ's trial and crucifixion, so I definitely cannot give you a specific day of the week and say it's certain. John 19:14 (EMTV) says, "Now it was the Preparation [Day] of the Passover ...". The other gospels do not state what day it was before the crucifixion, but all four gospels do mention it later, when Jesus' body is removed from the cross. John 19:31 says "it was the preparation [day]" and "that Sabbath was a high day", presumably meaning it was the first day of the Feast of Unleavened Bread. Mark 15:42 and Luke 23:54 both mention the preparation day. Matt 27:62 uses the rather odd expression, "the next day, which is after the Preparation [Day]" to refer to the feast day itself. It is clear that Jesus was crucified the day before the feast of Unleavened bread. Traditionally it has been believed that it was Friday, since Saturday is always a Sabbath. The gospels are consistent with this, assuming John was pointing out that the next day was not only a Sabbath, but also the day of the Feast, which is kept as a Sabbath regardless of the day it falls on. The gospels are also consistent with the Feast falling on a different day of the week, since it would still be appropiate to call the day before a "preparation day". Some Christians have proposed either Wednesday or Thursday as the day of crucifixion, but the gospels do not explicitly tell us what day it was. Apparently the Jews in the first century thought of the three spring feasts as parts of a single celebration, which it sort of is (Passover, killing of the lamb in the afternoon; Unleavened bread, begun with eating the Passover lamb right after sundown; and Firstfruits on the Sunday within the week. Since I originally wrote this, I found a book by Samuele Bacchiocchi, "The Time of the Crucifixion and the Resurrection". This online chapter claims the Greek word for "preparation" always meant Friday, and would not have been used for a Special Sabbath on another day. If Greek language studies support his viewpoint, then the traditional Friday date becomes more probable. I am not qualified to evalute this. 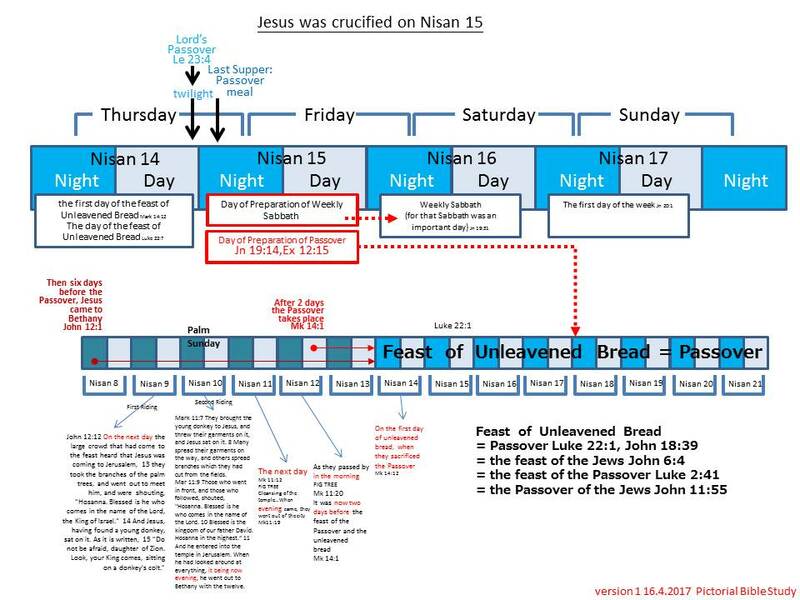 The traditional idea of a Friday crucifixion assumes that the Sabbath they were preparing for was the weekly Sabbath, and presumably also the first day of the Unleavened Bread feast. While that is possible, it is also true that the first day of the Unleavened Bread is always a Sabbath, regardless of which day it falls on. The passage you quote from John's gospel is therefore consistent with the named Sabbath being any day of the week. Presumably Christ was crucified on Nissan 14, the day originally specified as God's Passover day, the day the Passover lamb was to be killed. The Feast of Unleavened bread began right after sundown, which would be the beginning of Nissan 15. Theoretically, Nissan 14 could have fallen on any day of the week. There is a historical tradition that it was Friday, and that should not be ignored. If Nissan 14 fell on Thursday, then the 15th would be the special Sabbath and the 16th would have been the regular weekly Sabbath. In this case, we would expect the women to wait two days before returning to the tomb. If the 14th were earlier in the week, it is not clear why the women wouldn't have returned to the tomb on the 16th. Thus the Gospel of Mark clearly defines the phrase "day of Preparation" as "the day before the Sabbath." With the understanding that the Jewish Sabbath is the Seventh-day or Saturday Sabbath, the "day of preparation for the Passover" = "day before the Sabbath" can only mean FRIDAY. The technical term "Preparation" (Greek Paraskeue / Latin Parasceve) is used for Friday as well in the deuterocanonical books of Judith (8:6) and Second Maccabees (8:26), in the Jewish historian Josephus (Antiquities of the Jews 16:163), and in the early non-canonical Christian documents, Didache (8:1) and the Martyrdom of Polycarp (7:1). How Do We Explain the Passover "Discrepancy"? | Tim Staples, Catholic Answers the section Just the Facts, Please. To find the day of Christ’s crucifixion, you have to start with the resurrection and work your way backwards. On Easter Sunday morning most Christian denominations have actually been celebrating the discovery of the empty tomb; not the resurrection itself! I am absolutely certain, and the Bible makes it clear, that Jesus' resurrection was not at sunrise; Mary Magdalene came to the tomb, the first time, when it was still dark, and the tomb was already empty. There are plenty of Bible critics who point this out as a contradiction that disproves the accuracy of the Bible. Obviously you can't prepare the spices until after you buy them; so, if they bought the spices after the regular Saturday Sabbath, they would be buying them on Sunday, which would be too late to prepare them and then rest on the Sabbath. If you didn't know that there were two Sabbaths, with one day in between, then there would be a contradiction between the two gospels. But every word of the Bible is true and accurate. But don't forget that Jesus specifically said that He will be in the heart of the earth for three days and three nights. I believe that the plain teaching of the Bible is that Jesus celebrated, and fulfilled, the Passover with His disciples on Tuesday evening, was arrested Tuesday night, was crucified on Wednesday morning, buried on Wednesday evening (the start of Thursday for the Jews) and rose on Saturday evening (the start of Sunday for the Jews) during the offering and feast of the "Firstfruits of Harvest," as its fulfillment. Jesus was in the heart of the earth for three days and three nights; that doesn't mean a few hours Friday night, one whole day Saturday, and a few hours Sunday morning. And that doesn't take into account that in the Jewish reckoning of time, Saturday starts at about 6:00 on Friday evening (about the hour that He was buried [Matthew 27:57 & Mark 15:42]). The answer to your specific question: Jesus was crucified, about the 9th hour, on Wednesday morning, the 14th day of the first month (Nisan) of the Biblical, Hebrew calendar. According to reputable scholars the Sabbath was always on a Saturday. And, the day of the Passover Feast (which lasted a whole week ) would always be governed by the Hebrew calendar, a lunar calendar, and thus the Passover started on different days each year. However, we know from John's gospel that in the year Christ was crucified, the Passover AND the Sabbath fell on the same day. Thus, according to scripture, Christ had to be crucified on a Friday since it was the day of preparation for the Passover (not the preparation day for the Sabbath). The Scriptural reference is: Joh 19:31 Since it was the day of Preparation, and so that the bodies would not remain on the cross on the Sabbath (for that Sabbath was a high day), the Jews asked Pilate that their legs might be broken and that they might be taken away. So Jesus was crucified AND buried on a Friday, the Preparation day for the Passover. Jesus stayed in the tomb from Friday late afternoon until Sunday, the first Day of the week. That would be THREE DAYS in the tomb according to the way the Jews reckoned 'days'. (A partial day was counted as a day). If Jesus was crucified on Nissan 14, which is a date many (though not all) Bible scholars believe to have been the date of his death. The question then becomes what year it took place, as what day of the week have a lot to do with this. "The Jews therefore, because it was the preparation, that the bodies should not remain upon the cross on the sabbath day, (for that sabbath day was an high day,) besought Pilate that their legs might be broken, and that they might be taken away." Nissan 15 was called the First Day of Unleavened Bread, and was also referred to as a "High Sabbath." It did not necessarily coincide with the regular sabbath. One thing we must also take into account is that the Bible states that when Jesus was buried he was in the ground three days and three nights. It also states that early in the morning on the first day of the week the tomb was empty. If we start on Friday afternoon, the commonly stated day of the week for the crucifixion, then we have only two nights and one full day before Sunday morning. If Jesus was crucified on Wednesday, the 14th of Nissan (April 5), in 30 A.D. then he could have been in the tomb from Wednesday evening to Saturday evening, when he rose. Note that none of the Gospels explicitly state that the resurrection occurred on the first day of the week, only that the tomb was found empty at that time. Matthew records and earthquake and an angel rolling away the stone on the first of the week, but that does not mean that Jesus had not already left the tomb. After all, he would not have any need to have the stone moved in order to leave since he could appear among the disciples with all the doors closed and bolted before he arrived. Wednesday, April 5, 30 A.D. seems to fit all the details of the gospels best. One question I have seen raised against a date in 30 A.D. is that Luke chapter three mentions John's ministry, which started shortly before that of Jesus, as having begun in the fifteenth year of Tiberius Caesar. This would seem to indicate a date in 28 or 29 A.D., just a year or slightly longer before the crucifixion, which would compress the ministry of Jesus into a much shorter time than the commonly accepted period of three years. This is problematic, since John mentions three passover which would mean a period of at least a little over two years for Jesus' ministry. One possible solution might be found in the writings of Seutonius. The dates of 28 or 29 A.D. as the fifteenth year of Caesar Augustus is based on counting the beginning of his reign from either 14 A.D. when Augustus died, or from 13 A.D. when some say he was made co-Princeps with Augustus. Seutonius, however, indicates that Tiberius was made co-Princeps in 12 A.D., just after a triumph was held for him on his return from Germania. This would make the fifteenth year of Tiberius 27 A.D., and the date of 30 A.D. would fit. Not the answer you're looking for? Browse other questions tagged exegesis crucifixion gospel-of-john historical-jesus or ask your own question. Why did Pilate insist on writing 'Jesus of Nazareth, King of the Jews'? How do “once saved, always saved” advocates explain the Parable about wise virgins? Could Jesus have sweated actual blood in the garden of Gethsemane?